"Mystery of the Girls with Red Hair" is the 23rd Mandrake Sunday story. 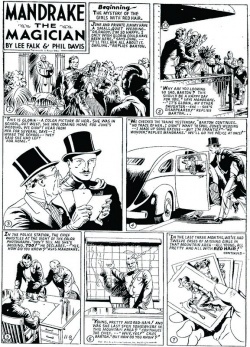 The story was probably written by others than Lee Falk and drawn by Phil Davis. Back in the US June and Jimmy have a small, quiet wedding. Junes sister, the red haired Gloria, was to come home for June's wedding but something have happend, she has disappeared. The police are dealing with a similar mystery, twelve girls with red hair are missing. Lothar, only in the second panel of the story ! Gloria, daughter of Colonel Barton. The title for this story is taken from the strip of November 8, 1942 (Beginning The Mystery of the Girls with Red Hair). This page was last edited on 26 May 2016, at 05:49.